Hand Soaps – Centraz Industries Inc. Pink Ice hand soap is a blend of highly refined soaps and surfactants, containing only the finest ingredients. A Foaming Pink Hand Soap version is also available for use in foaming soap dispensers. Anti-Bac Hand Soap is pleasantly scented, soft hand soap with the power of Triclosan. It is formulated with synthetic skin cleansers and emollients to clean and prevent dryness. 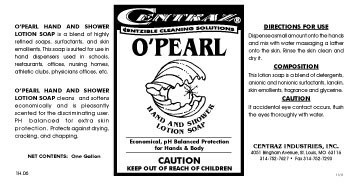 O'Pearl hand soap protects against drying, cracking, and chapping of skin. Soft & Blue is an inexpensive hand soap for bulk dispensing. Unlike most of its inexpensive counterparts: it is not harsh on the hands. It is formulated to rinse clean and condition your skin. Fresh & Gentle hand soap contains both lanolin and glycerin to leave the hands clean and soft. Gentle Clean is a pleasantly scented coconut oil-based hand soap. It is pH balanced for extra skin protection and has emollients to protect against drying, cracking, and chapping of skin. Orange Punch is a waterless hand soap with the scrubbing power of pumice and the grease-cutting strength of D-limonene. It is ideal for use in automotive shops and industrial facilities. Bio Power II is a waterless hand soap with the scrubbing power of Walnut shells and the grease-cutting strength of D-limonene. It's ideal for use in automotive shops and industrial facilities. Pummel Lotion Soap is a lotionized hand soap with pumice scrubbers. It cuts through tough grease and grime while conditioning the skin and leaving behind a pleasant feel and fragrance. Anti-Bac Foaming Hand Soap is pleasantly scented, soft hand soap with the power of Triclosan. It is formulated with synthetic skin cleansers and emollients to clean and prevent dryness. This is for use in foaming soap dispensers. NEW! Tender Touch Foaming Hand Soap is a foaming hand soap that is designed to return suppleness to dry, damaged skin. It has the pleasant scent of Pomegranate! Available in an 18 oz table top dispensing bottle. Foaming Coconut Oil Hand Soap is a pleasantly scented coconut oil-based hand soap. It is pH balanced for extra skin protection and has emollients to protect against drying, cracking, and chapping of skin. This is for use in foaming soap dispensers. Mulberry Foaming Hand Soap is a blend of highly refined surfactants and skin emollients that cleans and softens economically while protecting against drying, cracking, and chapping. It contains a pleasant Mulberry fragrance. This is for use in foaming soap dispensers.